A masterpiece. 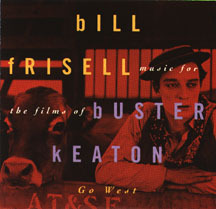 This was my first Bill Frisell album, and is still my favorite. It remains one of the most distilled, beautiful, and moving albums I have ever heard. Frisell, Kermit Driscoll and Joey Baron create an entire world on this album, lonely but hopeful vignettes that evoke an entire range of emotions. Frisell composed a few simple themes that shift from mournful to angry. Over these simple themes Driscoll's bass lows deeply and Baron employs an arsenal of colors with his trademark schizophrenic pops, clicks, and rolls. They underpin the furtive guitar playing of Frisell, who also uses loops and effects to augment the simple melodies. The interplay on this album seems almost telepathic, the work of one mind instead of three. This is not so much a collection of songs as a seventy minute piece, with recurring themes. This is an incredible album, highly recomended.